About twenty years ago, René Girard said, "...in stable systems the persecutors don't realise that they're persecutors; they don't recognise themselves in the portrait that their victims paint of them when they start to complain." "I'm black and proud of it." Around the same time, sitting across the table in my office at World Vision was Kevin Sheedy, Coach of the Essendon Football Club. Even then Sheeds was a legend. We were talking about Nicky Winmar's famous response to being told by Collingwood supporters to "go and sniff petrol" and "go walkabout where you came from." To his credit, Sheeds had been appalled by the fans. I had been appalled by their defenders. "They just don't get it," I said. "The say 'I didn't mean it' and 'I wasn't saying it in a racist way.' Are they that blind?" Yes, blind. As Girard was pointing out in his interview on the other side of the world, these defenders of free bigotry mostly didn't realise they were persecutors. Girard used this example: "Take your average Italian male or even a Frenchman (Girard is French-PJH), and tell them that they've always oppressed their wives. At first, they won't believe you. If you force them to, if you keep rubbing their nose in the same realities, over and over, even if they don't admit it, they'll end up glimpsing the truth." Of course, this is exactly what happened with racism in football. 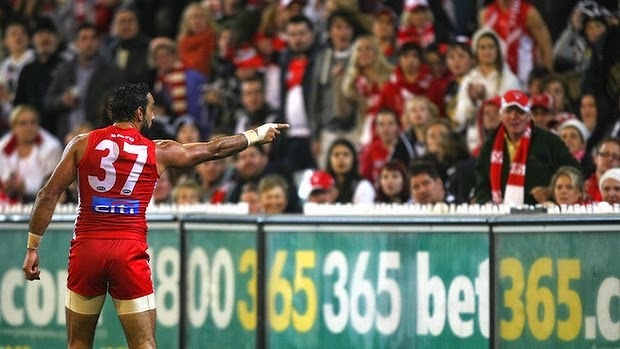 Twenty years on and few of us are surprised, let alone defensive, when Adam Goodes points his finger at another who did not realise she was a persecutor. And with that pointed accusation most of us concurred, with an awareness that we may not have had a decade or two before. "When the truth is spoken and repeated," continued Girard, "once it finds its way into the public domain, it always ends up making headway. Much faster than seemed possible, a consensus is formed on positions that, just a few years before, still seemed revolutionary and completely inadmissible to conservatives." In recent days, the conversation has expanded from racist language to embrace homophobic language. A Rugby player describes another player as a "f***king gay c**t", admirably combining obscenity, homophobia and misogyny in one economical phrase. Journalist Miranda Devine rose to his defence in print and on the television program "The Project". On the telly she was defending the use of the word gay. Gay used to mean happy and bright but hardly anyone uses it that way today. True: The Flintstones had a gay old time. As did Noel Coward (perhaps not the best example). "It is tyrannical" Devine intones "to demand that people must use a word only in the form approved by homosexual activists." Gay now means weak, or pathetic. Hmm. OK, maybe gay doesn't mean bright and happy any more. Yes, English is ever evolving but it is silly to suggest, as Devine did in her television interview, that nowadays "young people don't think gay means homosexual." Instead, she opined, "they use gay to mean lame." Hello? Are you listening to yourself Ms Devine? Just as lame is used to describe someone's lack of ability or endeavour, it also still means unable to walk. How can it be right to replace hatred of homosexuals with hatred of the disabled. And there's the problem. When words have more than one current meaning, we are going to notice the connotation. Telling an athlete he runs like a girl is an offence to him and all girls simultaneously. Not until a meaning of a word finally dies out of use entirely, can Devine's argument stand. I think it is fair to suggest that since we stopped teaching Latin roots in primary school, no left-handed person has taken much offence from the word sinister. On the other hand, our growing awareness of racist language has seen the wrong-way-spinning cricket ball increasingly called a googly rather than a Chinaman. Words matter. They can be used for good or ill. Sticks and Stones may break your bones, but words can destroy you. That's why Managing The Message has become a well-paid profession these days. If you say "budget emergency" often enough, the truth will be lost. But likewise, if we speak the truth over and over, more and more of us will get it. It cuts both ways. Footnote: René Girard's quotes are from an interview with Michel Treguer, originally published in 1996 as Quand ces choses commenceront. Thankfully we finally have an English translation, When These Things Began, Michigan State University Press, 2014. Excellent post Philip. As relevant to current events today as when you wrote it. Can Satan cast out Satan? It is a matter of record that my career as a recording artist spanned more than a decade. Four songs. Three records. Total royalties: less than $1. No reason to be jealous. It began accidentally in about the late 1960s. Here's the cover of the EP. And here's the back cover. "Nobody Knows" was later used to lull rowdy teenagers to sleep at Gold Coast Secondary School Camps run by the Methodist Church. Doubtless, my soporific performance enhanced sleepiness. 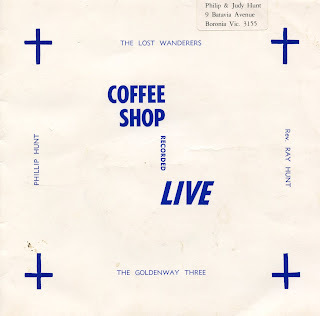 Also on this EP is a recording of my big sister's group, The Goldenway Three. Judith, the aforementioned Big Sis, is the lead and two other sisters (not mine), Janet and Heather Bishop, do the harmonies. I can be heard playing the piano on "Go Tell It On The Mountain". Following this brilliant start was my venture into country music with a song about a horse. Not any horse. Gunsynd, the Goondiwindi Grey.